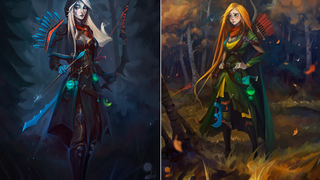 Artist Igor Artyomenko reimagined Crystal Maiden, Traxex the Drow Ranger, Windrunner and Lina the Slayer from Dota 2 and they now actually look like characters with personality. Especially love Windrunner and that piece's color palette. Here they are. I love that these characters, compared to others in similar pieces, have more than 2 or 3 arrows in their quiver.